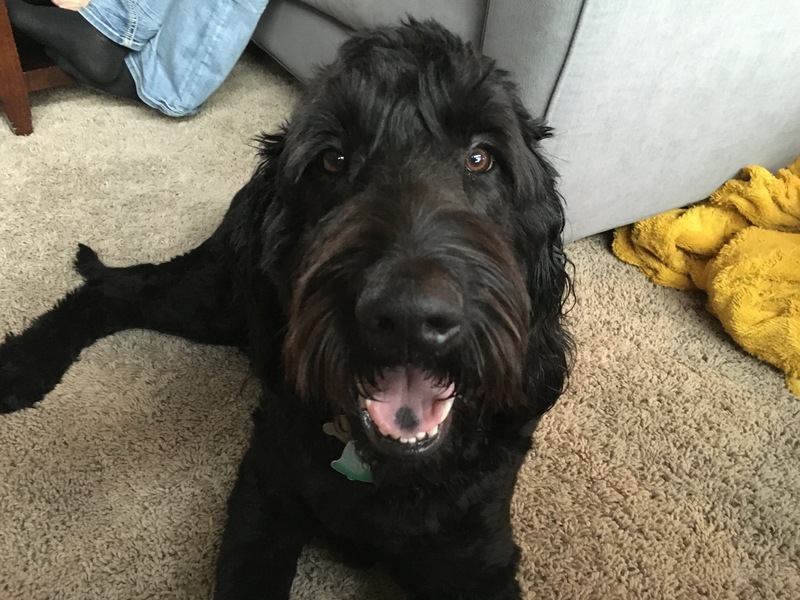 Reggie is a one-year-old Goldendoodle who mouthes, chews on inappropriate items, is an excited door greeter who also likes to jump up on guests. Usually when I arrive for a session I get a pretty good feeling for the dog based on his behavior. Not for Reggie though. He didn’t try to jump up on me once nor did he try to mouth me. I sat down with Reggie’s guardians to discuss his behavior and how I could best help them. In the course of that discussion I discovered that Reggie’s guardians had not taken him to a puppy socialization class. Puppy socialization is one of the most important things that any guardian can do for their dog. It is through these six and eight week weekly classes that your dog will learn how to play and interact with dogs he does not know. Puppies learn a number of important social lessons during these classes such as to not nip or mouth, not jump up so much as well as gain confidence around other dogs. Failing to take your dog to puppy socialization class can often result in a dog that is socially awkward and does not know how to properly interact with other dogs. In some cases this awkwardness can turn into aggression. Its best to socialize your dog this way up before its a year old. I always tell my clients this is time you will never get back. But Reggie is still young enough to benefit from socialization, so I strongly suggested that his guardians enrolled him in a doggy daycare facility a few times a week for the next month or two. I also suggested that his guardians take him to as many different places and activities as possible the spring, summer and fall. The more experience a dog has when its young, the more confident and better equipped it is to deal with unexpected things later on in life. The activities and experiences Reggies guardians arrange for him to have over the next 8 months will determine what kind of dog he grows up to be. I noticed that Reggie invaded everyone’s personal space pretty flagrantly. To help his guardians curb him of this unwanted behavior, I went through a series of escalating consequences that I often recommend to my clients. These nonverbal communication cues will make it easy for them to communicate exactly what they do, and do not want from Reggie. I also suggested they adopt my Petting with a purpose strategy. This involves asking the dog to do something such as sitting, coming or laying down on command before the human provides it with attention or affection. By making the dog earn it by following a simple command, we can develop and strengthen a healthy leader follower dynamic. Now that we had added some rules and structure to Reggie’s day-to-day life and were communicating with him in a way that he understood, it was time to repeat the door greeting exercise. Although the footage isn’t the most exciting that I’ve ever shot for the door answering ritual, Reggie’s guardians could not have been more pleased. They controlled the situation and effectively used their body language to communicate to Reggie that he was to stay off of the hardwood floor near the front door. I suggested that the members of the family collar text one another on their way home so that they could practice the store answering ritual for the next week or two. By the end of the session Reggie was showing respect for people’s personal space, had stopped jumping up or mouthing people and was looking to his guardians for their leadership. Reggie is not at all an aggressive or bad dog. He is simply a puppy who did not have enough structure and exercise in his life. By increasing his daily exercise and adopting these new rules and communication methods, it will be easy for his guardians to communicate what they want from their dog in a way he understands, respects and responds to. Combined with some social experience at day care for the next few weeks or months, Reggie will develop into a confident dog that loves and respects his guardians.